ROBERT “BOB” MCDOWELL ’52 reports that he and his wife, Yvonne, have re-retired again, this time from 22 years of helping establish Rancho Betania Christian Camp and Conference Center outside Hermosilla, a city in the Mexican state of Senora. Before that, Bob retired from 18 years as a Free Methodist pastor, and before that, from 25 years at Warm Beach Camp and Conference Center in Stanwood, Washington, where the McDowells now live in a retirement community. DALE DIETZMAN ’64 and CAROLYN DROSCHER DIETZMAN ’65 met in chemistry class at SPU, and you could say there was plenty of chemistry between them. Both were medicine-bound. Dale was a pediatrician at Walla Walla Clinic in Eastern Washington from 1974 until retirement in 2000. Carolyn was a public school nurse until her retirement in 2007. He enjoys fly-fishing while she is a flower grower at Welcome Table Farm, and both are enthusiastic grandparents. Members of First Congregational Church, the Dietzmans are longtime residents of Walla Walla, Washington. DOUGLAS LOVE ’74, a minister in the Foursquare Church, has returned to the Pacific Northwest after three years as a pastor in Cabo San Lucas, Mexico, and more than three years as a pastor in Boulder, Colorado. The former real estate agent and his wife, LESLIE CRAWFORD LOVE ’74, are thrilled to have time to spend with friends and family, including nine grandchildren. The Loves live in Lake Stevens, Washington. DANIEL DAPPER ’78 is vice president of sales and business development at Right Hemisphere, makers of graphical information management software. He lives in Shoreline, Washington. GAIL JOHNSON HART ’78 is pastor of Faith Lutheran Church in Kamiah, Idaho, and Ascension Lutheran Church in Orofino, Idaho. The two congregations are part of small communities bordering the Clearwater River. Says Gail, “I owe much inspiration to my childhood pastors, Herbert and Esther Roushey, who served as missionaries in Africa ... and served the Cloverdale Free Methodist Church.” Gail and her husband, KENNETH HART ’77, live in Nezperce, Idaho. The school nurse is considered a primary responder to whatever ails a student in Barrow, Alaska, the farthest north town in the U.S. The “whatever” can range from testing for tuberculosis to treating food allergies to comforting a child (or staff member) in mourning. Other cases may include head lice, asthma, frostbite, trauma, or neglect. 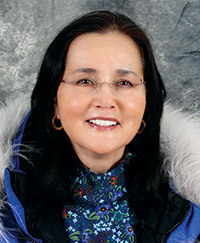 ESTHER JEFFERY ’74 is school nurse for 1,200 students, mostly Iñupiaq Eskimo, spread over four schools in the North Slope Borough School District at the “top of the world.” Though she focuses mostly on Fred Ipalook Elementary School, Esther also oversees the health needs of the middle school, high school, and alternative school in Barrow, with a population just over 4,300. She must be ready to act on very short notice. In the winter, that means making certain her car is plugged in when it is sitting still, to keep the engine warm. She is known for bringing with her kindness and calm assurance. “Part of God’s call to me is to serve in a remote location like Barrow and to meet the health needs of students from a variety of cultures,” says Esther, a Yup’ik Eskimo. For students grieving the death of a family member or dealing with cognitive disabilities, frequent repetition of concepts and instructions is often necessary. For her compassion and care of kids above the Arctic Circle, Esther received the 2015 School Nurse Excellence Award from the Alaska School Nurses Association. Married to retired Superior Court Judge Michael Jeffery, Esther says she treasures the cultural diversity and resiliency of the Barrow people. “School nurse is who I am as a servant of Christ,” says the mother of three Stanford graduates. In summers, Esther travels to Bristol Bay to participate in annual set-net fishing activities with her family. STEVEN DAVIS ’80 is the senior pastor at First Congregational Church of Redlands, California, and the former senior pastor at First Presbyterian Church of Manasquan, New Jersey. The psychology major and former Eagle Scout earned a doctoral degree from San Francisco Theological Seminary and master’s degrees from Columbia University and Fuller Theological Seminary. He is married to CINDY GRIEBENOW DAVIS ’82, former director of children’s ministry at Point Loma Community Presbyterian Church. The couple have four adult sons and live in Redlands. ANNE POLHAMUS ’81 proudly pinned her son, BENJAMIN POLHAMUS ’15, at SPU’s June 12 Prelicensure Pinning. Ben continues the family nursing legacy and wore Anne’s nursing pin, his grandmother’s nursing pin, and his own nursing pin before the day was over. Anne lives in Evanston, Illinois. JAMES “JIM” MOOS ’83, a graduate of Princeton Theological Seminary, is executive minister of the United Church of Christ’s Wider Church Ministries and co-executive of Global Ministries. Following his ordination in 1986, Jim, a former U.S. Air Force Reserve WORLDchaplain, served two congregations in North Dakota before accepting the call to Wider Church Ministries. He lives in Cleveland, Ohio. ANN DEIBERT ’86 recently completed a diploma in the art of spiritual direction at San Francisco Theological Seminary. She maintains a spiritual direction practice along with her ministry as co-pastor of Central Presbyterian Church in Louisville, Kentucky, where she has served for 19 years. Ann lives in Louisville. JAMES “JIM” LAWSON MED ’90 retired this summer from teaching at Abraham Lincoln High School in Tacoma, Washington, which hosted Chinese President Xi Jinping in September. Among Jim’s accomplishments was establishment of the Chinese language teaching program at Lincoln in the 2006–07 school year, which continued for seven years. Introduced to Chinese when he enlisted in the Air Force and when he studied at Yale University, Jim continued his Chinese studies after military service at the University of Washington. At ALHS, he and two other colleagues lobbied for starting a Chinese language program that included travel to China to meet with educators and encourage the development of a sister school exchange program. He predicts that the renewed interest in China will only increase the demand for future Chinese study programs at Lincoln. Jim lives in Port Orchard, Washington. KIMBERLEE CLEVELAND ’92 is a playwright whose pen name is Kimber Lee. Her work garnered a fellowship from Playwrights of New York, and she was named 2014–15 Aetna New Voices Fellow at Hartford Stage in Hartford, Connecticut. Her play brownsville song (b-side for tray) will be produced this year at the Lincoln Center and the Philadelphia Theatre Company; her play different words for the same thing premiered at the Kirk Douglas Theatre in May and was performed by the Center Theatre Group of Los Angeles to good reviews. She is a graduate of the MFA program at the University of Texas-Austin’s Michener Center for Writers and lives in Brooklyn, New York. HYE SOOK CHUNG ’93 is the executive director of D.C. Action for Children, a child advocacy organization that provides data-based analysis and policy leadership on critical issues of health, education, safety, and financial well-being for children living in the District of Columbia. Her experience includes work with the National Association of Counties, D.C. State Board of Education, and Head Start Quality Improvement Center. Before moving to D.C. Action, the Boston University graduate was the program officer at the Washington Area Women’s Foundation. Hye Sook lives in Washington, D.C., with her husband, son, and daughter. SHELLEY COLLINS ’94 is assistant professor of flute and musicology at Delta State University in Cleveland, Mississippi. Shelley was teaching in the classroom on September 14, 2015, when a gunman entered campus, killing one professor and later taking his own life. Shelley and another professor packed 45 students and a handful of faculty and staff into one room to look after them. She prayed with a student suffering a panic attack, and she prayed with the other students close by. “Praise God for the good guys,” she said in an email, referring to the large law enforcement response. Shelley lives in Cleveland with her family. ELIZABETH “BETH” BUTLER ARMSTRONG ’98 is an elementary school counselor at Battle Creek Elementary School in Salem, Oregon. Beth lives in Salem with her husband, Brian, and daughter, Jacy. ESTHER WILLIAMSON ’98 and DANIEL FLINT ’95 last spring basked in rave reviews from D.C. Theatre Scene reviewer Alan Katz. The occasion was their notable performances in Hamlet,the First Quarto, presented by Taffety Punk theatre group at Capitol Hill Arts Workshop in Washington, D.C. “Williamson gives Ophelia a depth I’ve never seen before ... encapsulates Ophelia’s insanity and fills it with heart-stopping emotion,” wrote Katz. “Daniel Flint splits his time between the usurper Claudius and his brother, Hamlet’s ghostly father. He nails each role, reveling in Claudius’ humanity, rather than his villainy, and honestly freaking me out with the otherworldliness of his Ghost.” Esther lives in Brooklyn, New York, while Daniel lives in Washington D.C. Daniel also had two plays published recently: his one-man play The Golem — A Dream Play, is available on Amazon. And Holiday of Errors with co-author Frank Lawler will be on stage in Seattle this December. BRYCE PHILLIPS ’03, owner, founder, and CEO of evo, is considered by Powder Magazine to be the most influential skier in the Pacific Northwest. Retired in 2013 after 16 years a professional skier who has appeared in Warren Miller ski films, Bryce has played a significant role in shaping the outdoor lifestyle culture through his online and brick and mortar retail business selling gear and fashion apparel for skiers, snowboarders, mountain bikers, wake boarders, and skateboarders. Before evo was founded in 2001, Bryce sold gear out of his residence hall room at SPU and soon he had retail showcases in neighboring rooms. evo today grosses nearly $50 million a year and employs nearly 200 people. Bryce lives in Seattle. HEATHER EGGEN BOWMAN ’01, a lawyer with Bodyfelt Mount LLP, was recognized in the 2015 issue of Oregon Super Lawyers magazine. She was identified among the top 5 percent of attorneys in that state. This was her second year to also be included in the “Rising Stars” list. Only 2.5 percent of Oregon lawyers receive that additional recognition. Heather focuses her practice primarily on employment litigation, professional malpractice defense, and insurance coverage. She lives in Portland, Oregon, with her husband JIM BOWMAN ’99. BRADY TURNER ’01 and his wife, Tiffany Oakes Turner, are “accidental entrepreneurs” and owners of Adrift Hotels Inc. In 2004, they developed the Inn at Discovery Coast, a 12-room oceanfront boutique hotel in Long Beach, Washington. In 2012, they purchased an 80-room property next to Discovery and transformed it into Adrift Hotel & Spa. This summer, they opened Ashore Hotel in Seaside, Oregon, a 22-room accommodation. Adrift was named one of the 2015 best romantic getaways in Washington state by Vacation Idea magazine. The Turners live in Long Beach, Washington. ROBERT DANIELLE ’02 successfully defended his dissertation, titled Narratives of Professionals Transitioning From Non-Academia to Higher Education Leadership Positions at For-Profit Institutions. He earned his doctoral degree from Benedictine University (Lisle, Illinois). He is now a doctor of education, higher education, and organizational change. He is also the dean of academic affairs and interim Seattle metro campus president at DeVry University. Robert lives in Edgewood, Washington. JOEL HENG HARTSE ’03 completed his doctoral degree in teaching English as a second language at the University of British Columbia. He is a lecturer in the faculty of education at Simon Fraser University. His wife, SARAH HENG HARTSE ’02, runs a caricature and illustration business and recently gave birth to their second child. The Heng Hartses live in Vancouver, British Columbia. MELISSA JEFFERY POTRATZ ’03 has completed a master’s degree in education. She is a mom to two boys and teaches full-time in the Beaverton School District near Portland, Oregon. Her husband, AARON POTRATZ ’03, is a licensed professional counselor with a private practice in Tigard, Oregon. He owns Discover Counseling and supervises counseling interns in graduate school. The Potratz family lives in Beaverton, Oregon. KYLE FELDMAN ’05 is a full-time brewer at Rooftop Brewing Company near the SPU campus. The former head brewer at Barley’s Brewing Company in Columbus, Ohio, Kyle brought an expertise in cask- and barrel-aging with him in his return to Seattle, where he grew up just blocks from the brewery. “He is the perfect fit for Rooftop,” says brewery owner Craig Christian. “He’s an amazing and meticulous brewer — a real craftsman.” Kyle’s wife, SARAH WARE FELDMAN ’06, who holds an MFA in acting from Ohio State University, trained with The Royal Shakespeare Company and this summer acted in the first English-translated production of Ballarini in London. Both Kyle and Sarah were theatre majors at SPU. They live in Seattle. BRAD KULP ’08 has a passion for kids and believes that with the right outlook, they can make the world a better place for generations to come. That’s why he’s an account executive with The NED Show. NED, which stands for “Never give up, Encourage others, Do your best,” is a positive behavior and motivational school assembly program popular throughout North America, the United Kingdom, Australia, and New Zealand. The show has performed at the White House 11 times, and in 2015, almost 2.5 million children will attend a NED Show assembly. 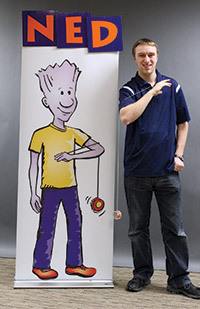 Through comedy, yo-yo tricks, and storytelling, NED performers teach the importance of goal-setting, making good choices, and giving teachers respectful attention. “I believe that having the right attitude about school and being conscientious about the way we treat others can go a long way in developing a generation of kids who will leave the world a better place than they found it,” says Brad, who prefers to “leave the performing to the talented people.” He spends his days communicating with elementary schools in all 50 states, Canada, and beyond, selling them on the virtues of The NED Show. Brad was a business administration major and is married to SPU nursing graduate AMY ZURCHER KULP ’07. They have two children and live in Lake Stevens, Washington. NANCY NORDENSON, MFA ’07, has published her second book, Finding Livelihood: A Progress of Work and Leisure (Kalos Press, 2015). A chapter in the book has been named a “notable” essay in Best American Essays 2015. Three other chapters previously earned “notable” designations in Best American Essays and Best Spiritual Essays. She lives in Minneapolis, Minnesota. DARLENE JAMES, MED ’08, is a high school social studies teacher and recipient of the James Madison Fellowship. A total of 51 fellowships were offered for 2015 by the James Madison Memorial Fellowship Foundation in Alexandria, Virginia. Named in honor of the fourth president of the United States, the fellowship will fund up to $24,000 of Darlene’s further course study toward her second master’s degree. The study must include a concentration of courses on the history and principles of the U.S. Constitution. The Herriman (Utah) high school teacher competed for a fellowship with applicants from each of the 50 states, the District of Columbia, Puerto Rico, and U.S. island and trust territories. The foundation was established by an act of Congress in 1986. Darlene lives in Herriman. LIVIU BIRD ’12, a former Falcon goalkeeper and no stranger to SPU’s Dean’s List, is a soccer analyst, freelance contributor to NBS Sports and The New York Times, and one of the main soccer writers for Sports Illustrated. He learned the game in the streets of his native Romania and later played semiprofessionally. Liviu coached at the youth and collegiate levels. This summer he married JENNIFER UHER BIRD ’11, a 2015 graduate of the University of Washington doctoral program in physical therapy. She works at The Doctor’s Clinic in Silverdale, Washington. The Birds live in Seattle. CHRIS HOKE, MFA ’13, is a Skagit County jail chaplain exploring the appropriation of monastic practices inside America’s penal system. He works with gangs and violent offenders in Washington state’s Skagit Valley. Through his work with the organization Tierra Nueva, directed by BOB EKBLAD ’82 and GRACIE JOHNSON EKBLAD ’82, he cofounded Underground Coffee, a coffee roasting business that employs men coming out of prison and addiction. His work has been featured on NPR and in Christian Century. His book, Wanted: A Spiritual Pursuit Through Jail, Among Outlaws, and Across Borders (HarperOne, 2015), has been called a “liberating, transformative chronicle” by Kirkus Reviews. Chris lives in Mount Vernon, Washington.